Friday Morning at 0900 the Pass in Review ceremony at Great Lakes Recruit Training Command began and after the preliminary review of colors and a short film about life in Boot Camp we got our first look at the graduates. 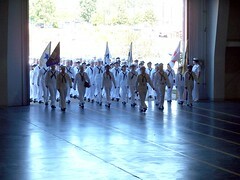 My nephew’s unit, Division 290 Ship 11 was the first to come marching into the drill hall. They looked great. A sharp unit with crisp military bearing. For my nephew, Tom, the journey began on June 18, 2008 when he arrived at Great Lakes Recruit Training Command. Friday morning, August 15, 2008 it culminated with his shipmates as they passed in review. As we drove onto Recruit Training Command through the Illinois Street entrance our car was inspected by Navy Police and then after our IDs were checked we were directed to a parking area. Driving across the parking area I exclaimed to my brother that we were on the grinder, as we called it then, that I had graduated from in October 1972. Once we were parked, we walked with hundreds of other parents and families to the drill hall for this momentous occasion in the lives of these the U.S. Navy’s newest sailors. Much has changed in the years since I had been there. Only one building looked the same, the rest had been replaced with new construction. It was great to be back. I know all the parents and friends were filled with anticipation and the drill hall where we were eventually seated was full of families anxious to be reunited with loved ones. As each division entered the public address announcer stated the unit and so when to door rose and the announcement, “Division 290 Ship 11” rang from the speakers my heart began to beat a bit faster. I couldn’t find my nephew from among the crowd of shipmates that surrounded him. My nephew, Dan who was seated next to me was the first to spot his brother. I trained my Kodak even more and tried to capture these moments for history. God smiled on my efforts and I managed to get dozens of great shots of these brave young men and women who have answered the call to serve their country. In all 967 new sailors graduated that morning. Being in the presence of so many brave young men and women filled with reverent awe and gratitude. I felt a sense of hope for the future of our country that I haven’t felt in a long time. This entry was posted in Spiritual and tagged gratitude, Great Lakes, Recruit Training Command, US Navy. Bookmark the permalink.